If you like the look of power and grace working in unison, then Showa might be the fish you are looking for, with its bold, wrapping black markings that complement the colors of red and white to create a dynamic panorama in three colors. 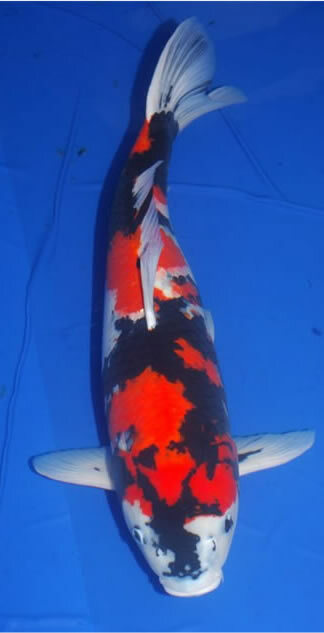 Showa is considered one of the “big three” along with Kohaku and Sanke, and at most koi shows, one of these varieties will usually win Grand Champion. A Showa can be recognized by any of several easily identifiable characteristics. As already mentioned, three colors must be present, but it is the placement of these colors that sets the Showa apart from other three-colored fish. Black should appear somewhere on all parts of the body – the head, trunk, and caudal (or tail) section. This black should appear as large wrapping bands or bold patches, sometimes connecting with each other. A Showa should begin (somewhere near the nose) and end (somewhere near, but not into, the caudal fin) with black. Black also normally appears at the base of each pectoral fin as an added enhancement. The red should appear much as a kohaku pattern, that is, in artistic but simple patterns throughout the body. A normal ratio of the three colors is 1/3 of each, but variations from this are acceptable, and are largely a matter of personal preference. Selecting a young Showa can be a tricky proposition. This is because the black doesn’t usually appear fully until 3 or 4 years of age. To complicate matters further, if a baby showa has black that appears “complete”, it may very well disappear, and reappear years later in totally different locations! 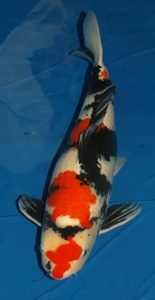 For this reason, it is best to select a showa with an attractive kohaku (red and white) pattern, but with hints of black to come, which will appear as bluish shadows beneath the skin. A more recent development in the Showa variety is known as “Kindai”, or modern, Showa. This type of Showa is more delicate in appearance, with more white than red or black, and with the black and red appearing in distinctly different locations from each other rather than overlapping as on traditional Showa. Whichever type of Showa you like, you should have at least one of these in your collection. With loving care and a little bit of luck, it may well become the King of your pond.